A thanks to all of you for your prayers. I have no other news, so keep praying. As a stress release, after praying today for a long time and teaching, (last week of teaching for the semester), I took two silly online tests of which state I should live in...hmmm. The first one came up Oregon and the second, Alaska, where I have actually lived. But, I am in Iowa. I guess my ancestors on the Oregon Trail passed down some westering blood. Supertradson came up supposedly favored to live in Wyoming. Interesting, but weird. Do not pass up the "still small voice" when you hear it; it may be your guardian angel. Do not ignore those nudges from God to phone someone or pray for someone. You never know what the entire story is behind these instincts to do something. Those who follow these instincts are given more and more by God. God can trust the person who listens. A man in my immediate family, one of my brothers, is very suicidal. He lost his job last year and now is involved in a divorce. Please at this moment, ask Our Lady of Fatima to pray for him and intercede to save him from destruction. He has been away from the Church for thirty years. Thanks. And, if there are any priests reading this blog today, please say a Mass for him. Also, the woman I wrote about last week is still planning an abortion. Please pray. There has been much bad teaching in some Catholic courses, colleges, universities and seminaries on what is invincible ignorance. The vast majority of people living in the Western world do not fall under the category of invincible ignorance. Those is nations were the Gospel and the Teachings of the Catholic Church have been severely suppressed may fall under this category. But, not people in the First World. It is dangerous for Catholics to forget that many people choose not to become Catholics, after learning what Catholicism is. Those people are not ignorant of the Truths of the Church. We must pray and realize that many people say "no" to God in His Church. I believe grace is given to people in order to see and find the Truth. God denies no man or woman salvation. But, to pretend that those who have heard and have moved away from the Word are saved, is a dangerous position. We judge no one, but we cannot say that such and such a group of people under the Protestant banner will go to heaven. A misinformed or badly informed conscience is not invincible ignorance. Invincible ignorance means that the person involved has not heard the Gospel preached, nor has been given any opportunity for conversion to Catholicism. Those who persist in other faiths after having heard the Truth are not in invincible ignorance. I have read your reported comments, quoted today by The Tablet, saying, amongst other things, that you "don't identify with the expressionless person who stands outside the abortion clinic reciting their rosary". I do hope you have been misreported. Please let me know if that's the case. I thought I would let you know that I do identify with the person outside the abortion clinic praying their rosary, whether or not the person is expressionless. Just 30 minutes ago I received the following message from a wonderful group in England which organizes, at great personal sacrifice, people to stand outside an abortion clinic in Twickenham, west London. The message said: "Pray hard for "Lucia", 20 weeks pregnant. Her abortion is booked for next week in Twickenham." I have prayed for Lucia. I did so before writing to you. Whilst writing, may I ask that you pray for her too and ask others to do so? In my experience, these prayers work. I am constantly getting messages from the same source, the wonderful group in England,which tell me about young women who, seeing the people outside the abortion clinics praying, change their minds and keep their baby. If I may, I will send you a full report on the work of this group. It's probably fair to say that tens of thousands of unborn children, each one made in the image and likeness of God, are killed every day throughout the world. For example, there are 500 killed daily in Britain, thousands in the US, thousands upon thousands in China, to name just three of the world's 193 countries. Your Excellency, if it were Catholic priests or Jews who were being killed, or threatened with being killed, by national laws in Britain or in other parts of the world – would we expect, any day of the week, ever to enter a Catholic Church for Mass without the matter being mentioned, or being prayed about at that Mass? Would we not be denouncing, and rightly denouncing, the killing of Catholic priests or Jews, in every pulpit in the world – notwithstanding the past sins and scandals associated with members of the Catholic Church? The Jew, the priest, the unborn child are all created in the image and likeness of God. I really don't think you would be saying, if national laws had allowed the killing of Catholic priests or Jews over the past few decades: "In the past we have concentrated too much on the killing of Catholic priests or Jews...". Indeed, you would probably be saying: "We can never do enough to denounce this grotesque evil". Your Excellency, please reconsider your reported position. May I come to meet you, in the company of one of my colleagues who has had an abortion, and discuss the whole matter with you? Briefly, this morning, online, I had a discussion with two Catholics in England about Walsingham. I need to clarify my thoughts in a medium which allows for developed thoughts. The first point that I want to make is that there is only one, true, Catholic and apostolic Church, and that is the Catholic Church. The Anglicans are Protestants, no matter how they see themselves. They are not in union with us and we need to work to help them see this. In other words, there can be no pretense regarding Anglican Orders or the apostolic continuity in the Anglican congregation. Second, we are called to evangelize as lay people. We are called to pray, fast, do good works, include teaching to bring back our brothers to the Faith. There is no salvation outside the Church, and although the merits of the Catholic Church save others outside, this cannot be presumed. Third, Walsingham was destroyed by the Anglican and although some good Anglican have built up their shrine there, it is a Protestant shrine, without holy water and without the sacraments. Until the Catholic shrine is built up again, it will remain in the shadow of the Protestant one. Fourth, Catholics need to live and work there. To have pilgrimages and retreats coming in and out does not create a presence of Catholicism. We need lay people adoring Christ every hour of the day in Walsingham and we need penance being done there daily by Catholics for the Anglican community and others. If we do not take back Walsingham, it will turn into a mecca for ssm and the types of businesses which cater to those involved. Do not kid yourselves about this. Catholics in England need to see themselves as the Church Militant again and understand that the powers we fight are those unseen, working behind the trappings of lies and heresies. If a person is in mortal sin, they cannot received graces. The natural law tells all humans what is right and wrong. One is not converted by ambiance but by grace. Two years, I started a plea on this blog to help set up 24/7 Adoration and a TLM house of prayer in Walsingham. I had several women who wanted to join for prayer for a few months every year and I had some people who said they would come weekly. However, I could not raise the money for the house. The house is now sold and what I feared and saw in prayer will now happen. The neo-pagans in the Anglican Church will continue to take over Walsiingham. Now, there are many excellent Anglo-Catholics in Walsingham, but in the last two years, it was obvious to me that the far-left agendas in that church were taking over the Walsingham scene. I wrote about this several times. Sadly, this opportunity to have a house of Eucharistic Adoration for the laity and a place for priests who are TLM to come and give retreats is gone, with this house being sold. It was perfect for a small community, with five bedrooms each with washing facilities, huge gathering rooms and a conservatory which could have been a chapel. The enclosed garden would have been perfect for prayer. Many opportunities for putting God and Mother Mary back into Walsingham will not happen, as there are so few places for prayer and serious contemplation and none which are traditional. I also wanted to bring the pro-life presence to Walsingham, as it is not there. God gives us daily opportunities for evangelization. The world hates the truth and hates the Catholic Church. How sad that the town of the national shrine to Our Lady, which should be Catholic, is increasingly not so. "When England returns to Walsingham, Our Lady will return to England". Pope Leo XIII said this. If Catholic England does not return to live in Walsingham, there will be no revival. I was warned of this two years ago. Too bad Catholics are not willing to support Catholic projects in England, Wales and Scotland. Perhaps another house will open up for sale, but this one was reasonable, as the prices there are terrifically high. Our Lady of Walsingham, pray for us for mercy. Jesus is the Stumbling Block. So many billions of people in the world cannot accept His Divinity. 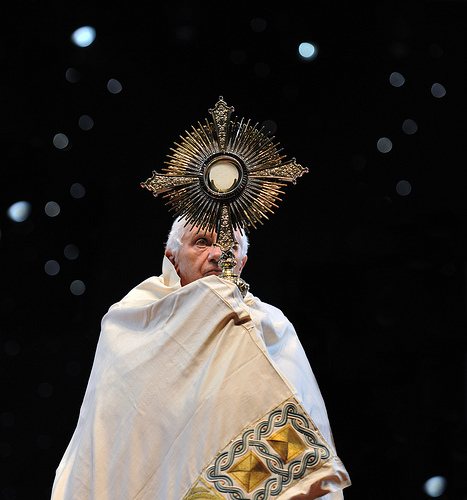 Catholics are called "idolators" by the adherents of many religions, including low church Protestants, Muslims, Christian Scientists and others who do not see that Christ is Truly God and Truly Man, present in the Holy Eucharist. Faith in Christ is pure gift, although one can come to Him through Reason and Revelation. Most people do not bother with either. Pray for four people who I know well who simply cannot accept the Divinity of Christ. Pray, please, that they have the gift of faith. Those billions who do not accept Christ ignore the last sentence in today's Gospel. Thank You, Holy Spirit, for the gift of faith and give to those billions in darkness this light. Padre Pio understood the Dark Night of the Soul. This is taken from the book, Padre Pio's Word of Hope, Ed. Eileen Dunn Bertanzetti, OSV Press, Huntington, IN. 1999. "...within this fog thee is a clear, pure, delightful, divine and delicate light...You cannot discern this light, but it is none the less true that precisely this light strengthens and invigorates you in the service and persevering love of the Lord. It is a light, moreover, which is for you and for your soul the beginning of contemplation. You cannot fully achieve this contemplation until you have submitted humbly to the purification of the senses. Yet, who would believe that this light, which in the beginning invades the soul with such desolation and pain, is later to raise it up to mystical and transforming union?" How nice that the great saints and writers of perfection agree on the steps to purification. Do not give up in the Dark Night, no matter how long it is. God is doing something quietly in the darkness. I wanted to blog again now, as the storms which hit this area all day seemed to have passed when the night came, but now, the wind, rain, and lightning begin again. I shall have to shut down the computer, but let me type one thing. God gives us the desires of our hearts, minds and souls. If we are in sanctifying grace, we shall pray according to His Will. Our prayers, as a friend of mind noted, do not make things happen, but when we pray in the Will of God, His Will happens according to our prayers, which are in Him. Earlier, during the storm, I was struggling to find Hope in my heart. I begged God to give me and a friend of mine who is also struggling a sign of Hope. Daily, I seem farther from returning to Europe and my son. Within minutes, the sun found a slim breach in the clouds, as it set, and a huge rainbow appeared in the sky in the east. The quintessential sign of Hope was given to me, for me and for my friend. Have Hope. Believe in Goodness, Who is God. Trust in His Mercy. More later, I have to shut down in the storm starting up again. The winds have increased. Severe thunder storms will delay my posting this a.m.